One of the oft repeated stories by our grandmother was that of the old lady who travelled inside pumpkin through a forest filled with wild animals and managing to trick the wolf who planned to eat her up, thanks to her garment made of pumpkin. Truth be told, more than relishing this edible gift from nature and use it as a source of nourishment, I loved to hear stories and folklores relating to it. The only time I ate it was in the form of a native Indian sweet dish called “ghargi”, where a mixture of pumpkin is mixed with flour, jaggery and spices and deep fried. Unlike the western countries, where pumpkin makes a seasonal appearance mostly in autumn and winter, in India it is available throughout the year. 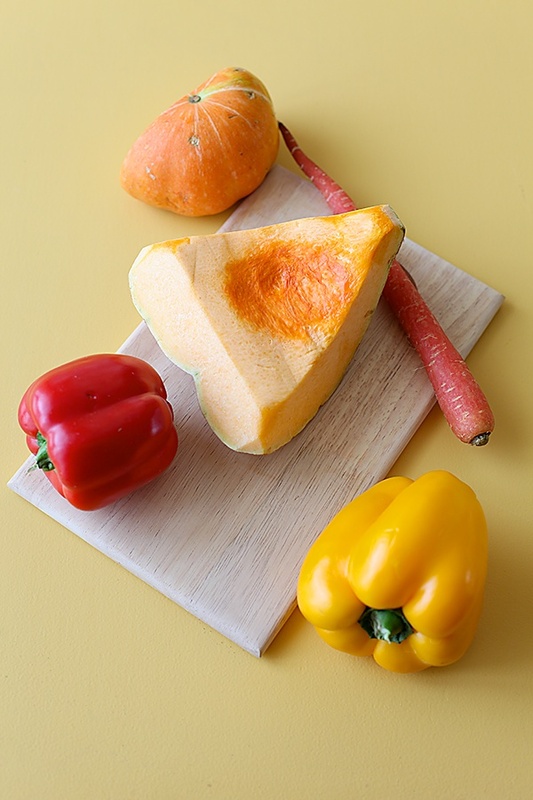 Belonging to the family cucurbitaceae, alongside many other popular squashes widely consumed in India, the red pumpkin holds a special place in Indian culinary arts primarily due to its year round availability and its price making it affordable to everybody. Rich in fire and an excellent source of vitamins A, K, C, loaded with iron, potassium and magnesium, the pumpkin is a store house of nutrients waiting to be discovered and cooked in numerous ways. I discovered the simplicity and taste of this vegetable in the form of this soup. It is quite a challenge to make healthy vegetarian soups tasty, particularly when you dont use readymade stock, dont have the time or patience to mull over preparing fresh stock which could take hours or dont use one of those magic seasoning cubes. 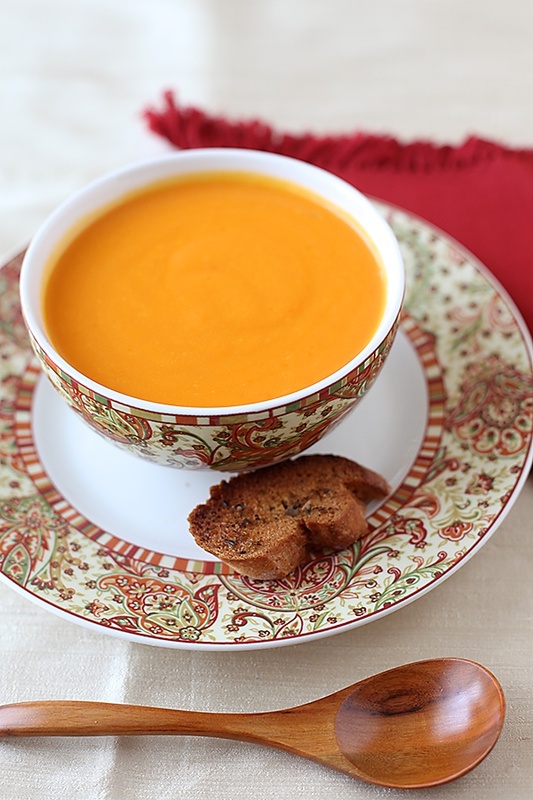 This soup was a wonderful surprise being exceptionally great in taste. The bell peppers provide an innate sweetness and the carrot and the potato provide body and make the use of thickeners unnecessary. 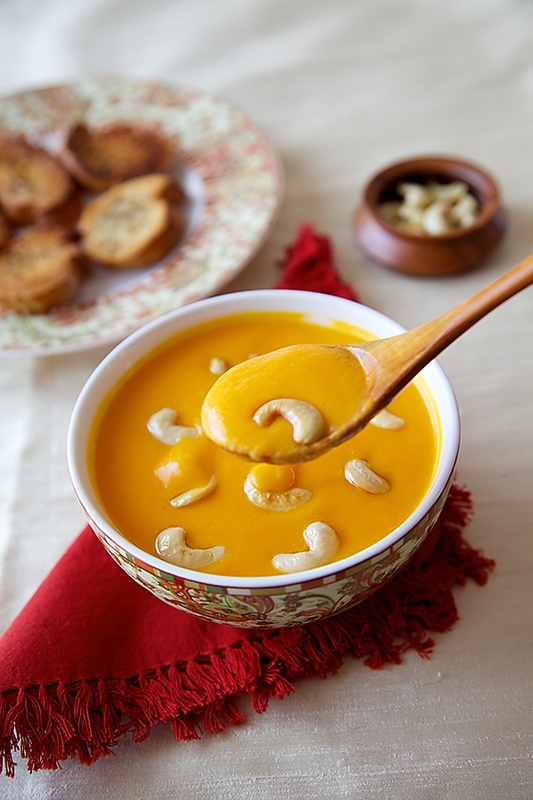 The lentils provide nutrition and protein apart from adding plus points to the taste factor and the cashews take it up a notch further by adding texture and an element of magnificence by transforming a simple soup and making it exotic. If I didnt have guests, probably I would skip the cashews and serve it up with some crusty bread or baguette. I love to cut baguettes diagonally, brush them with generous quantities of olive oil, sprinkle them with some herbs and toast them in a hot oven until nicely browned and crisp. 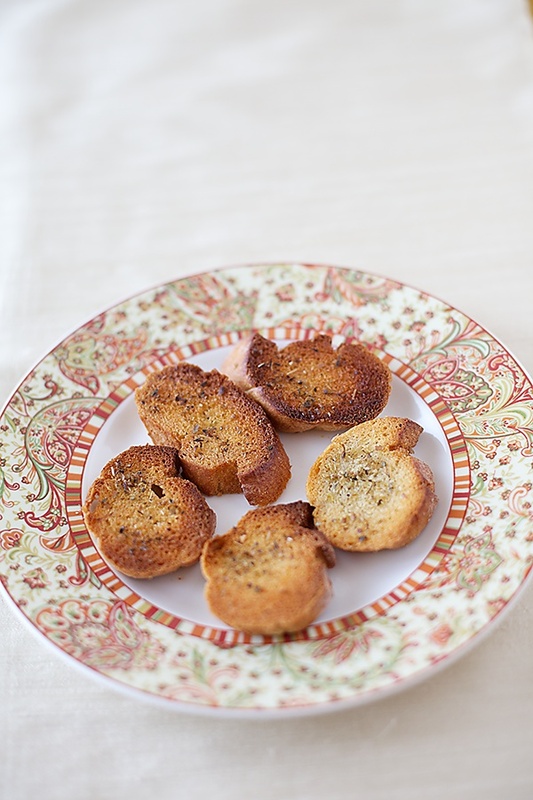 Made this way, they go exceptionally well with soups and are great crowd pleasers too. My sister took me to a boulangerie in Pune when we visited her this weekend and I picked up a lovely baguette from there after a round of golf with my brother in law where my little one had an introductory session of golf, that peaked his interest and curiosity in the game. And if I did have guests, I would add a salad and a simply made or even a fancy rice dish. And this would make a lovely menu to feed the body, mind and soul. Coming back to this soup, I relished every spoon of the delectable orange hued concoction and trust me, if I have to say a few good words about soup, the non soup loving person that I am, it has to be pretty good to pass my scale of examination. And this soup did not just pass it, but even surpassed my expectations. In a large pot or a pressure cooker, heat the olive oil. Stir in the asafetida before the oil begins to smoke and put in the cut vegetables, the pumpkin, the bell peppers, the carrot and potatoes. Stir fry for a few minutes. Wash the mung dal and put it into the vegetables. Pour in the water and salt and pressure cook till done, about 2 whistles. Alternately, if making in the pot, cook until all the vegetables and the dal are done, about 45 minutes to an hour. Allow to cool and blend the vegetables and the dal in a food processor or a mixer. Return the puree to the pot and put in the pepper and adjust the salt and the water to your liking. 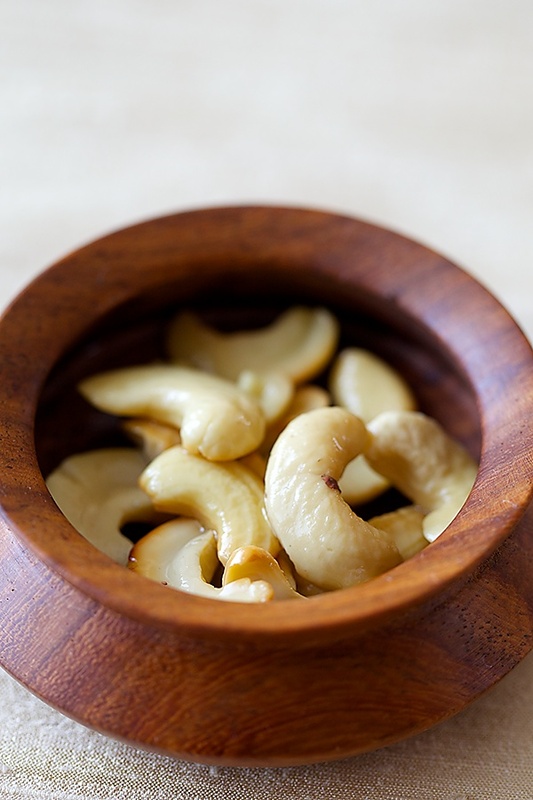 In a small wok, heat the oil or ghee if using and put in the cashews and stir until golden brown, about 2 to 3 minutes. 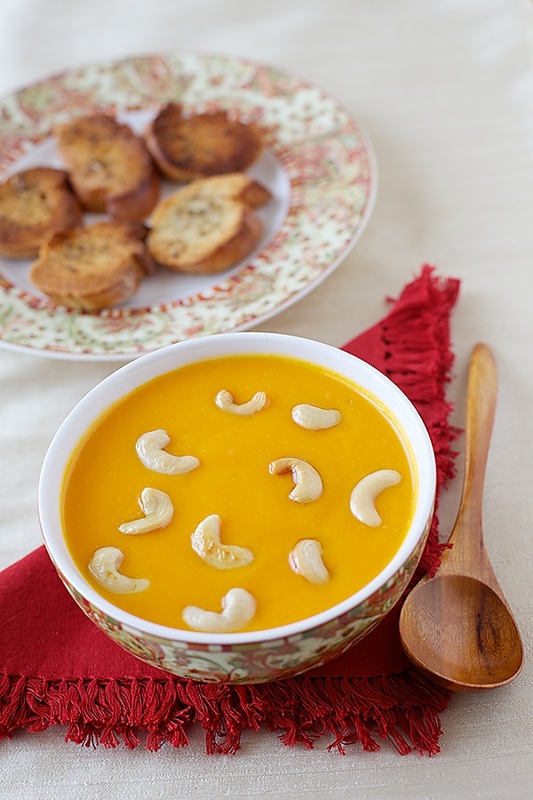 Sprinkle the cashews over the soup and serve with warm crusty bread or baguettes. Perfect winter warmer! Brilliant photographs! Wonderful! it really looks yummy! shall definitely try.Another dish that I learnt to prepare at my in-laws place with red pumkin is the famous Maharastrian dish called 'Dhapate' it is like a thaleepit or jawar roti with red pumkin and spices.shall mail you the recipe if interested or better idea is please accept my invitation according to your convenience whenever you are in Pune. Hi Shruti – Please post the receipe of Dhapate. Would love to try it. Beautiful soup. And gorgeous photo of you and your son! Have a joyous New Year! Hi Anushruti, I am a total soup lover and have tried all of them on your site. This post looks equally interesting and lovely pics, as usual. Is the pumpkin you are using here same as butternut squash, the bulb shaped vegetable. Can I use butternut squash in this recipe. EL: Thanks and wish you the same. 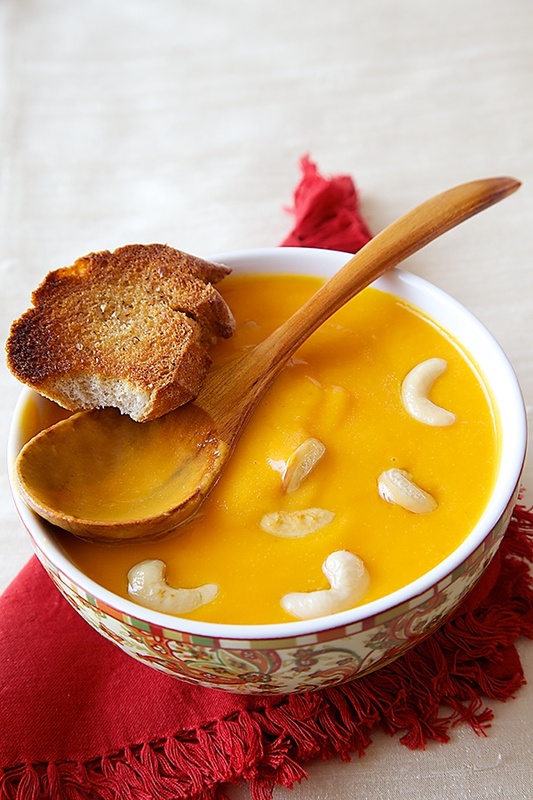 Ashwini: I think butternut squash would be gorgeous in this soup. Hari Chandana: Yes..the colour is one of the most striking aspects of this soup. It is primarily due to the addition of red bell pepper. Lovely recipes. They are sattvick and nutritious! Great for making prasadam. Tried this soup a few days ago. We loved it. Can you share any ekadashi recipes. Non grains and lentils. Soup looks great and lovely pics too 🙂 First time on your space and you have new fan! I appreacite a site just for satvic food!!!! Mansi: So happy you enjoyed this soup! Ashwini: Glad you liked this soup. Thanks for the feedback! Poornima: There are ekadashi recipes on the site already. Will label it and post more. Thank you for the interest. Sita: Thank you so much!